Since the 1970s, Boulder County and the City of Boulder have jointly adopted the Boulder Valley Comprehensive Plan (BVCP) to guide planning and development in the city and surrounding area. Every five years the BVCP is updated to reflect changing conditions and community values. Initial scoping for the BVCP 2015 Update began in late 2014. The update addressed a wide range of topics to ensure the plan provides a relevant vision as Boulder Valley looks ahead to the next 15 year planning horizon. Topics addressed include resilience, energy and climate, housing mix and location, among others. With City Council’s vote to renew the Intergovernmental Agreement (IGA) on Aug. 28, the City of Boulder and Boulder County have approved the Boulder Valley Comprehensive Plan’s 2015 update, pending two decisions related to map changes in Knollwood and Spring Valley Estates. When the Boulder Valley Comprehensive Plan is updated every five years, members of the community and staff can request changes to the land use or area designations of properties and to policies and text. All of the land use change requests for properties proposed by the public have been reviewed and given determinations. There are two remaining Planning Area designation change requests left that were proposed by staff. Those consist of Planning Area designation changes to the Knollwood and Spring Valley Estates subdivisions. The two remaining proposed planning area changes are both affected by the November 2016 voter approved Blue Line changes. These changes are being considered as part of this major update as they have health and safety implications, and the next opportunity for consideration would be the next five year update. To view these requested changes, visit the Knollwood and Spring Valley Estates tab. Receive email or text updates and notices of meetings from Boulder County about the Boulder Valley Comprehensive Plan. County Planning Commission on Nov. 15, 2017 on the third floor of the Boulder County Courthouse, 1325 Pearl Street at 1:30 p.m.
Board of County Commissioners on Nov. 16, 2017 on the third floor of the Boulder County Courthouse, 1325 Pearl Street at 3:3o p.m. Dates may be subject to change. The public will have an opportunity to speak at the meetings or send can send in comments by email before the meeting. A copy of the staff report, including analysis and staff recommendations, will be posted to the city and county websites prior to the hearings. As part of the Boulder Valley Comprehensive Plan (BVCP) 2015 Major Update the Commissioners held a public hearing on November 15, 2017 on a request to bring the Spring Valley Estates subdivision into Area II of the BVCP Planning Area. The neighborhood is currently outside of the BVCP Planning Area. The change will require two steps: 1) Expansion of Planning Area III outer boundary, and 2) a Minor Service Area Adjustment (Area III to Area II). This request was initiated by the city in response to previous amendments made to the city’s blue line, as well as health and safety concerns. The hearing will provide an opportunity for members of the public to comment on the requested Planning Area map change. On October 19, 2017, the Board of County Commissioners held a public hearing on a request for a Minor Service Area Adjustment (from Area III to Area II) for the Knollwood neighborhood. The discussion included a staff presentation, a public comment period, and questions from the BOCC regarding the proposed map change. The BOCC approved the comments drafted by staff, noting points regarding the safety and health of the residents, as well as the appropriateness of allowing for annexation in the future if residents wish to do so. City of Boulder Planning Board approved the changes on Oct. 19, and City Council will vote on the matter on Nov. 14. More information about the BVCP Planning Areas Map and amendment process can be seen on the city’s website at. View the City of Boulder BVCP calendar for the full list of city and county meeting dates. On July 26, 2017, the Board of County Commissioners deliberated and voted on the BVCP adoption draft (policies, text, and maps), CU South land use changes, and the Comprehensive Development Plan Intergovernmental Agreement (including plan amendment procedures) with the City of Boulder. View the video of the meeting. The Board of County Commissioners (BOCC) approved a renewed Intergovernmental Agreement (IGA) with the City of Boulder. The version approved by the BOCC included a set of amendment procedures that would allow for both BOCC and Planning Commission involvement (along with City Council and Planning Board) in final approval of conversion of the Area III Planning Reserve to Area II, a necessary approval step to enable that currently rural land north of Boulder be annexed and developed at urban densities. The BOCC also approved land use designation changes and guiding principles for CU South. In addition, they supported and built upon a formal recommendation by Planning Commission calling for the city to work with county staff to ensure best practices are employed to achieve the best flood mitigation outcomes for the community. Finally, the BOCC approved the updated Boulder Valley Comprehensive Plan policy, text and maps. They were the last of the four decision making bodies to do so. However, given conditions on City Council’s approval of the IGA, and given the BOCC’s approval of a different version of the amendment procedures than were approved by council, the IGA will need to go back to City Council for approval in the same form approved by the BOCC. A motion to approve (a) the land use designation for CU South, changing from Low and Medium Density Residential (LR and MR) and portions of Open Space-Other (OS-O) to Public (P) and Parks, Urban, and Other (PK-U/O) and retaining portions of OS-O and (b) to approve the Guiding Principles, as set forth in Attachment A of the July 26, 2017 Board of County Commissioners’ Staff Report. This motion passed unanimously. BOCC carried forward the following recommendation from Planning Commission: A motion to recommend that the city to work with county staff in developing best practices that go above and beyond federal and state standards to reduce risk to life, health and economic impacts downstream from the proposed flood mitigation given the continued risk from climate change. BOCC added the following to the recommendation: Ensure the mitigation facility is designed at a minimum in accordance with State Engineer’s Rules and Regulations for Dam Safety and Dam Construction. For this flood mitigation project, the design rules may require the maximum probable flood criterion (MPF) to help protect the dam from a catastrophic failure. This motion passed unanimously. A motion to approve the 2015 Update to the Boulder Valley Comprehensive Plan as set forth in the June 15, 2017 BVCP Adoption Draft (Attachment C of the July 26, 2017 Board of County Commissioners’ Staff Report) with minor amendments from the Board of County Commissioners and Planning Commission (Attachment B of the July 26, 2017 Board of County Commissioners’ Staff Report) and amendments to the Policy 1.05 and the definition of Parks, Urban and Other (PK-U) (Attachment A of the July 26, 2017 Board of County Commissioners’ Staff Report). This motion passed unanimously. A motion to approve the Intergovernmental Agreement (IGA) between the City of Boulder and Boulder County titled “Boulder Valley Comprehensive Development Plan Intergovernmental Agreement,” including the revised BVCP Amendment Procedures as set forth in Attachment E [of the July 26, 2017 Board of County Commissioners’ Staff Report (version reflecting Planning Commission’s recommendation for Area III Planning Reserve)]. This motion passed unanimously. On July 19, 2017, Planning Commission deliberated and voted on the BVCP adoption draft (policies, text, and maps) and CU South land use changes, and gave feedback to the BOCC on the IGA and amendment procedures. View the video of the meeting (select Event Bookmark #6). A motion to approve (a) the land use designation for CU South, changing from Low and Medium Density Residential (LR and MR) and portions of Open Space-Other (OS-O) to Public (P) and Parks, Urban, and Other (PK-U/O) and retaining portions of OS-O and (b) to approve the Guiding Principles, as set forth in Attachment A of the of the Supplement to the July 19, 2017 Planning Commission Staff Report. This motion passed unanimously. A motion to recommend that the city work with county staff in developing best practices that go above and beyond federal and state standards to reduce risk to life, health and economic impacts downstream from the proposed flood mitigation given the continued risk from climate change. This motion passed unanimously. A motion to approve the 2015 Update to the Boulder Valley Comprehensive Plan as set forth in the June 15, 2017 BVCP Adoption Draft (Attachment C of the Supplement to the July 19, 2017 Planning Commission Staff Report) with minor amendments from the Board of County Commissioners and Planning Commission (Attachment B of the Supplement to the July 19, 2017 Planning Commission Staff Report) and amendments to the Policy 1.05 and the definition of Parks, Urban and Other (PK-U) (Attachment A of the Supplement to the July 19, 2017 Planning Commission Staff Report). This approval is conditioned on retaining four body decision making for a service area expansion plan approval in Area III Planning Reserve. This motion passed 6-2. Planning Commission strongly prefers to maintain the current process without modification for Area II (land use designation changes) and Area III Planning Reserve. Planning Commission’s highest priority is to ensure four-body review is maintained on service area expansion approval for Area III Planning Reserve. If certain decisions are to become three-body review processes, Planning Commission strongly urges BOCC to refer relevant items to Planning Commission for recommendation before making decisions. This motion passed unanimously. On June 28, 2017, Planning Commission (PC) and the Board of County Commissioners (BOCC) held a joint public hearing on all matters related to approval of the 2015 Boulder Valley Comprehensive Plan Major Update (Docket BVCP-15-0001) pertaining to Boulder County, including policies, text, and maps, and proposed CU South land use map changes. The scope of the hearing also included renewal of the Comprehensive Development Plan IGA between Boulder County and the City of Boulder (IGA-17-0001). The Planning Commission and BOCC accepted both written and oral testimony. The hearing included staff presentations and staff answering clarifying questions for the Planning Commission and BOCC. The hearing was livestreamed. Deliberation and decision making did not occur at the hearing. Action Requested: None, Study Session only. Staff report for May 17, 2017 Note that the staff report was updated on May 15, 2017 to incorporate a link to the City of Boulder Open Space and Mountain Parks report and analysis for the April 12 Open Space Board of Trustees meeting (see p. 10 of the PDF). POSAC reviewed site suitability analysis and issues related to open space values for the portion of the University of Colorado Boulder’s (CU) South Campus property (“CU South”) currently designated as “Open Space – Other” (OS-O). This discussion followed a study session with the City of Boulder Planning Board on April 6, a study session with City Council on April 11, and a discussion and recommendation with the city’s Open Space Board of Trustee’s (OSBT) on April 12. In accordance with the BVCP, POSAC and OSBT have a responsibility to review changes to the comprehensive plan that affect an area designated as Open Space. A study session with the County Commissioners and Planning Commission was held to provide input on the BVCP Draft Plan and key policy areas. Open office hours were offered to provide opportunities for community members to receive information and provide specific feedback on multiple projects related to the Boulder Valley Comprehensive Plan (BVCP) Update and Inclusionary Housing program. These informal drop-in events offered the chance learn more and provide specific feedback one-on-one with city and county staff. BVCP – The 2015 update to the Boulder Valley Comprehensive Plan is nearing completion. Proposed changes reflect community input and preferences on a wide range of policy areas including: housing affordability and diversity, managed growth – future jobs and housing, resilience, subcommunity and area planning, and more. Community members are encouraged to provide feedback on the draft plan through April 21. Adoption hearings are scheduled starting in May. For more information, visit www.bouldervalleycompplan.net to view the draft plan and access the online feedback form. Inclusionary Housing – The city’s inclusionary housing program has demonstrated considerable success since 2000, but new challenges are prompting an update to the program. The city is considering adding a middle income requirement, incentivizing more on-site affordable development, and other minor changes. City staff are requesting feedback these initial concepts from the community. For more information, visit www.HousingBoulder.net to view the March 21 City Council Study Session materials. The Board of County Commissioners held a study session to for topics related to the renewal of the Comprehensive Development Plan Intergovernmental Agreement (IGA) between the City of Boulder and Boulder County, which is scheduled to expire on Dec. 31, 2017. Draft Boulder Valley Comprehensive Plan – After more than two years of community dialogue, the initial draft of the update to the Comp Plan is now complete. Following input from community members and at study sessions in April, staff will prepare a revised draft plan for adoption. City and county bodies are scheduled to adopt the plan update this summer. 3303 Broadway – Share your thoughts about a staff recommendation for land use changes for 3303, 3345, 3505 – 3517 Broadway and 1160 – 1194 Juniper Ave.
Inclusionary Housing Program – Learn how the current program works and share your thoughts about potential updates aimed at increasing affordable housing in Boulder. CU South – Learn more about the CU South project, including an updated suitability analysis. Provide input about potential future uses and guidelines for the property’s future. City staff will also be available to answer questions about the South Boulder Creek Flood Mitigation Study as it relates to the CU property. 3261 3rd Street land use designation changes under consideration. The BOCC reconsidered its Sep. 27, 2016 decision regarding the land use designation of this property (Land Use Change Request #25). The item has been presented for reconsideration due to a change in circumstances related to the location of the Blue Line. The Board of County Commissioners approved the changes to 3261 3rd Street. Additional policy updates and updates on other BVCP topics. Staff provided additional information on BVCP policy updates under consideration. Action requested: None. Study session only. A study session was held on the key policy choices related to land use and jobs-housing balance. Staff provided background and updates on recent analysis on scenarios, results from a second survey, directions toward land use changes, and city decision-makers’ input on housing and land use policy alternatives. Planning Commission reconsidered its previous land use and area map change decision for 3261 3rd Street (Request #25) due to a change in circumstances related to the location of the blue line. Planning Commission voted (9-0) to approve the staff-recommended map changes. Planning Commission reconsidered its September 21, 2016 decision to change the land use map designation for the parcels at 6655 Twin Lakes Road, 6500 Twin Lakes Road, and 0 Kalua Road (Requests # 35 and #36). Planning Commission voted (5-4) to not change the current land use designations. 3261 3rd Street land use map change, decision to reconsider. BOCC made a determination of whether to reconsider a previous land use designation change decision for this property due to a change in circumstances related to the location of the blue line (Land Use Change Request #29). The Board voted 3-0 to reconsider. Key policy choices related to land use and jobs-housing balance. Staff provided background and updates on recent analysis on scenarios, results from a second survey, directions toward land use changes, and city decision-makers’ input on housing and land use policy alternatives.Study session only. CU South site suitability. Staff provided background on recent site suitability studies and exploration of appropriate land use for the property and issues to address.Study session only. Planning Commission took input on the Sept. 21, 2016 decision to change the land use map designation for the parcels at 6655 Twin Lakes Road, 6500 Twin Lakes Road, and 0 Kahlua Road (Requests # 35 and #36). Staff presented an addendum to the original August 30 staff recommendation. The focus of discussion was requested to be new information that may inform Planning Commission’s decision. Specifically, Planning Commissioners expressed interest in the following topics: appropriate width and location of a wildlife corridor; infrastructure and services available in the area, and how the city and county would address potential impacts of development; considerations related to land use designation categories, and options that would result in housing density in between the existing low and medium density residential categories. Public testimony was taken. Action requested: None. Public hearing only. Decision to be held at the Feb. 15, 2017 Planning Commission meeting. Staff reviewed the latest schedule and provided general status updates for the2015 Major Update. In particular, staff presented information and field questions related to: Planning Commission reconsideration schedule for the Twin Lakes parcels, CU South Land Use change deliberation schedule and status, Trails Map and related policy discussion, the status of the second community survey, and job and housing balance scenarios which are the focus of community forums taking place through early 2017. Public testimony was not taken. Staff continued the November discussion of BVCP policy updates, with a focus on sections 4 (Energy and Climate), 5 (Economy), and 6 (Transportation). Staff provided an update on Section 7 (Housing), as well as sections discussed at the November Planning Commission meeting. Planning Commission held discussion and provided feedback following public testimony. Staff reviewed the policy update process underway as part of the Boulder Valley Comprehensive Plan Five Year Major Update, and highlighted key items proposed for revision. Direction and feedback from PC was requested and taken. Public testimony was taken. Docket BVCP-15-0001 was agenda item #4. Staff reviewed the policy update process underway as part of the Boulder Valley Comprehensive Plan Five Year Major Update, Planning Commission members had the opportunity to ask questions of staff, discuss topics of interest, and provide recommendations for changes to the current proposed policy updates. Discussion item only. No public testimony was taken. Listen to audio of the October 19, 2016 Planning Commission meeting. Deliberation and decisions by the Board of County Commissioners took place on Tuesday, September 27, at 3:30 p.m. No further public testimony was taken. Deliberation and decisions by the Planning Commission took place on Wednesday, September 21, 2016. at 1:30 p.m. No further public testimony was taken. Board of County Commissioners and Planning Commission Public Hearing On August 30, 2016, a joint Public Hearing of the Board of County Commissioners and Planning Commission was held to consider staff recommendations and public comment related to three Land Use Change Requests in Area II and III of the Boulder Valley Comprehensive Plan. Two alternative proposals for changing the land use designation of parcels located on Twin Lakes Road in Gunbarrel were part of the Twin Lakes Stakeholder Group facilitated discussion process, which met seven times from April-July 2016. The facilitation process brought together three parties: the Twin Lakes Action Group, the Boulder County Housing Authority and the Boulder Valley School District. Objectives of the discussions, per a Boulder City Council motion, were to: 1) jointly recommend areas of expertise and the selection of experts to inform the desired land use patterns for the area, 2) jointly recommend the appropriate range of potential housing units for the parcels, with consideration to intensity and community benefit, and 3) ultimately recommend a timeline for formulating a set of guiding principles to inform next steps. Staff provided an update to the Boulder County Planning Commission in a public meeting study session on June 15, 2016, on the Boulder Valley Comprehensive Plan Major Five Year Update – Phase 3 activities and next steps. View BVCP-15-0001: Staff report to Planning Commission for June 15, 2016. The Boulder County Planning Commission and County Commissioners met in a public hearing joint session on January 26, 2016, to hear change requests and staff’s recommendations. Public testimony was taken, followed by Planning Commission deliberation and motions/votes. The joint hearing was webstreamed and archived (select Event Bookmark 27), and the audio file of the Planning Commission deliberation is available as an MP3 file. On January 27, 2016, the Board of County Commissioners held deliberation and took motions/votes in a public meeting. The public meeting was webstreamed and archived. Note: Items not voted-on by Planning Commission or BOCC did not move forward for further study. On September 17, 2015, a joint study session was held to provide an update to the City Planning Board and the County Planning Commission on the Boulder Valley Comprehensive Plan update work to date and receive feedback on the foundations work (i.e., Trends Report, baseline data, projections, fact sheets, and mapping); the Land Use Request process; the August 31st Community Conversation and Kickoff at Chautauqua; the revised focused topics for the plan update; and next steps. The joint meeting also provided an opportunity for the two boards to converse together about the BVCP update. This meeting was a discussion item, no action was requested. Public testimony was not taken. On August 4, 2015, the Board of County Commissioners were presented an update on the community kickoff, trends report, proposed survey, other foundations work, and upcoming events related to this Five Year Update. No action requested. On July 15, 2015, the Planning Commission held a study session to provide an update on the community kickoff, trends report, proposed survey, other foundations work, and upcoming events related to this Five Year Update. This was a discussion item, no action was requested, and public testimony was not taken. On April 30, 2015, the Board of County Commissioners held a study session on the public engagement plan and BVCP Update foundational elements with the City of Boulder Community Development & Sustainability Department and the Boulder County Land Use Department. View the study session (select event bookmark 11). On April 16, 2015, a public meeting was held on Community Engagement Plan, Work Plan, and Update on Foundations Work. The purpose of this joint study session was to provide an update to the City Planning Board and the County Planning Commission on the Boulder Valley Comprehensive Plan (BVCP) work to date and receive feedback on the overall work plan with emphasis on foundations work; the Community Engagement Plan ideas; and preliminary ideas and issues to address in the BVCP update. The joint meeting also provided an opportunity for the two boards to converse together in the early stages of the 2015 update. This was a discussion item, no action requested. Public testimony was not taken. View the meeting agenda and packet. When the Boulder Valley Comprehensive Plan is updated every five years, members of the community and staff can request changes to the land use or area designations of properties and to policies and text. All of the land use change requests for properties proposed by the public have been reviewed and given determinations. There are two remaining Planning Area designation change requests left that were proposed by staff. Those consist of Planning Area designation changes to the Knollwood and Spring Valley Estates subdivisions. These two remaining proposed planning area changes are both affected by the November 2016 voter approved Blue Line changes. These changes are being considered as part of this major update as they have health and safety implications, and the next opportunity for consideration would be the next five year update. More information about the BVCP Planning Areas Map and amendment process can be viewed on the City of Boulder website. The minor service area adjustment would change the BVCP Planning Areas Map designation for the Knollwood neighborhood from Area III – Rural Preservation – to Area II. The change to Area II would allow for the consideration of future annexation to the City of Boulder. Spring Valley Estates is located outside the current BVCP Planning Area boundary. If approved, this change will move Spring Valley Estates into Area II which would allow for the consideration of future annexation to the City of Boulder. Please note, these changes are not annexations; this is a change to the BVCP Planning Areas Map that would make these subdivisions eligible for annexation in the future. Boulder County used an automated online comment form for the BVCP 2015 Update process. This was the official channel for submitting comments for the BVCP Update process. Only comments submitted through the form were sent directly to those Planning Commissioners who have opted to receive them. Staff compiled comments submitted by email, regular mail or dropped off at the office. ***NOTE:*** Planning Commission took action and did not approve any changes to Land Use Map designations for the Twin Lakes Road requests (Requests #35 and #36). The requests are no longer being considered as part of the Boulder Valley Comprehensive Plan Update (Docket BVCP-15-0001). The Boulder County Planning Commission officially closed the hearing and comment period for the Twin Lakes Road requests at the conclusion of the January 18, 2017 Planning Commission hearing. Comments received on the Twin Lakes Road requests after the close of the January 18, 2017 hearing were not added to the public record for this docket. * Some Planning Commissioners have opted to receive automatic emails of comments submitted through the online comment form. Other Planning Commissioners have opted to view compiled sets of public comments only. Planning Commissioners received a full compilation of comments received since their original Sept. 21, 2016 decision for the Jan. 18, 2017 reconsideration hearing for the Twin Lakes parcels through the close of the hearing. When the Boulder Valley Comprehensive Plan is updated every five years, members of the community can request changes to the land use or area designations of properties and to policies and text. For this update, there were requests to change the land use or area designation for 30 properties and eight requests for policy and text changes. The Board of County Commissioners (BOCC) and Planning Commission (PC) held a joint public hearing on August 30, 2016 to consider staff recommendations and public comments related to four land use change requests as part of the Boulder Valley Comprehensive Plan (BVCP) Major Update. (The hearing was webstreamed and archived.) The Planning Commission held a public meeting on Sept. 21, 2016 to deliberate and decide on the Land Use Change Requests staff recommendations, and the Board of County Commissioners decided on these matters on September 27, 2016. Listen to the Sept. 21 Planning Commission meeting audio and the September 27 Board of County Commissioners meeting recording (choose Event Bookmark #9). The Aug. 30 and Sept. 21 agendas included requests for Land Use Changes at: 3261 3rd Street (Request #25), 2801 Jay Road (Request #29), and 6655 and 6500 Twin Lakes Rd., 0 Kalua Road (Requests #35 and #36). The request related to 2801 Jay Road (Request #29) withdrew from this process following the September 21 Planning Commission meeting. Therefore, the Board of County Commissioners made decisions on the 3261 3rd Street and Twin Lakes requests. Both Planning Commission and the Board of County Commissioners voted in favor of the staff recommendation for these items, with additional recommendations to the remaining decision making bodies. The Planning Commission decided at its October 19 meeting (listen to Oct. 19 meeting audio) to reconsider its decision regarding the Twin Lakes requests (Requests #35 and #36). Planning Commission reconsidered this item on January 18, and February 15, 2017. Planning Commission reconsidered its September 21, 2016 decision to change the land use map designation for the parcels at 6655 Twin Lakes Road, 6500 Twin Lakes Road, and 0 Kalua Road (Requests #35 and #36). Planning Commission voted (5-4) to not change the current land use designations. Please see the link to Twin Lakes (above) for more information about the Twin Lakes land use change requests. Both Planning Commission and the Board of County Commissioners voted in favor of staff’s original recommendation to change the Area II / III boundary to coincide with the location of the blue line as it existed at the time the request was submitted, along with a change to an Open Space-Other designation for the area west of the proposed Area II/III boundary. The county decision makers’ votes took place in September, before a November ballot initiative in which voters approved amendments to the location of the blue line. The amended blue line would be located at the western edge of the property. Due to the changed circumstances staff and the requestor proposed an alternative location for the Area II/III boundary prior to the city decision making bodies’ hearings on this matter. Both the City of Boulder Planning Board and City Council decided in favor of staff’s revised recommendation. As a result, this item will return to the county decision making bodies for reconsideration in early 2017. For more information, see the staff report to City Council for their Dec. 13, 2016 meeting. For more information about all change requests, including those that were not approved for further study, see the interactive map of Areas II and III with photos and details such as the address, parcel size, current land use and a description of the proposed change. One task of this update is to align policies in the plan with master plans and programs approved by the City of Boulder and Boulder County since the 2010 update was completed. Staff has worked with city and county advisory boards including the Planning Board, Open Space Board of Trustees, Transportation Advisory Board, and the county’s Parks and Open Space Advisory Committee to create drafts reflecting possible changes. Staff has also worked with the community on updates to the policies. Go to the City of Boulder’s BVCP Policy Integration page to review draft policy updates and to learn more about next steps. You can also check out the City of Boulder’s BVCP Get Involved page for information on upcoming events. The citywide scenarios are aimed at addressing those focus areas and objectives of this update and the plan’s sustainable urban form policies. Building from earlier work to identify “opportunity areas” in the community – centers, corridors, industrial/innovation areas, three major concepts are being explored in the scenarios to address a range of potential future housing (and jobs/housing balance). For more information about the Land Use Scenarios, please visit the city’s Focus Areas page. Meeting will be posted as scheduled. See the City of Boulder BVCP page for a full listing of upcoming meetings related to policy updates, as well as the BVCP as a whole. CU Boulder South (“CU South”) is a 308-acre site owned by CU Boulder located south of the RTD Table Mesa Park-n-Ride. The property is currently in unincorporated Boulder County and classified as Area II in the BVCP, which makes it eligible for annexation. The university seeks to annex the property into City of Boulder jurisdiction and ultimately develop portions of the site for housing, recreational and academic uses. The site has also been identified as an appropriate location for flood mitigation infrastructure. Changes to the land use designations on the site were approved as part of the BVCP 2015 major update (for information on county approvals, see the summaries, related meeting summaries and staff reports for the following meetings: BOCC July 26, 2017; Planning Commission July 19, 2017 under the Public Meetings tab). The CU South land use designation change process was unique in that a comprehensive set of guiding principles were developed through a collaborative effort with substantial contributions from city and county decision making bodies, members of the community and staff. The collaborative process through which the guiding principles were developed involved efforts to balance the importance of the land for flood mitigation purposes and open space values, while maintaining the previous land use designations’ allowance of over 1,000 housing units on the property, as well as CU’s interests in using the property for housing, recreation and academic uses. Final approval from county decision bodies included formal recommendations related to use of best practices to exceed state and federal standards for flood mitigation design. Land use designations provide broad guidance for future uses on the site. At the time of annexation, the city and university will negotiate an intergovernmental agreement(s) to more precisely detail future uses and process for the site. The guiding principles will play a central role in defining the details of that agreement (or agreements). The county’s decision authority pertained only to the land use designation changes. County staff and decision makers will play an advisory / referral role as the property advances through later development stages, including annexation. The Park (PK-U/O) designation is for the property anticipated to be used for flood mitigation. This designation was selected in order to clarify that the northern area of the property is intended for flood control measures and compatible recreational uses, and not a broader set of uses that could occur under the Public designation originally proposed for much of the property. Open Space-Other (OS-O) designation was retained for portions of the property, focusing on land with the highest ecological and open space value, as well as land currently protected from flooding by the CU levee. The portions of the property with potential for development of housing and other structures is designated Public (PUB), the same designation used for other CU properties. View descriptions of the land use designations. Guiding principles include eight general principles as well as more comprehensive principles for areas designated Open Space-Other, and areas designated Public and Park-Urban/Other. The eight general principles address: Flood Mitigation, Collaboration, Public Participation, Access, Agreement Topics, Other Options, Land Use Designation Changes, and Annexation Timing. Each decision body held a study session on the CU South topic (BOCC, Jan. 31; Planning Board, April 6; City Council, April 11; Planning Commission, May 17). The Board of County Commissioners presented a number of questions related to flood mitigation topics at their Jan. 31 meeting (view meeting summary). City staff prepared responses in the form of revised South Boulder Creek Flood Mitigation Frequently Asked Questions. Following the May 17, 2017 Planning Commission meeting regarding CU South, the Board of County Commissioners asked staff to respond to Planning Commission’s guidance related to the Public land use designation and the Planning Commission’s concern that the designations presented were not specific enough to address the types and extent of development which could occur at CU South. County Staff worked with city staff to provide more specifics regarding future uses on the CU South property. City staff addressed input from the county Planning Commission on May 17, and worked to incorporate county staff’s concepts into guiding principles and BVCP language related to CU South. The County Commissioners and staff recognize the early stage of the development process for CU South, and that the county’s role is limited to consideration of the Land Use Designations which are high level designations and cannot bring certainty to final development outcomes for the property. County staff supported the recommended land use designations for the property, with an understanding that staff guiding principles will play a central role in helping to shape future development on the property, and that future stages of the process will reflect the county’s priority to retain extensive open space. Throughout the proposed Land Use designation process for Twin Lakes parcels there have been many questions raised. Staff has combined information from previous staff reports, memos, and supplementary documents to provide key facts for the requested land use designation changes for these parcels. View Key Facts about the Twin Lakes Land Use Change Requests. Letter from Colorado Parks and Wildlife (CPW) regarding Twin Lakes – CPW provided comments about the wildlife at Twin Lakes. While the letter was received after the Planning Commission decision it is being provided to the public as additional information. 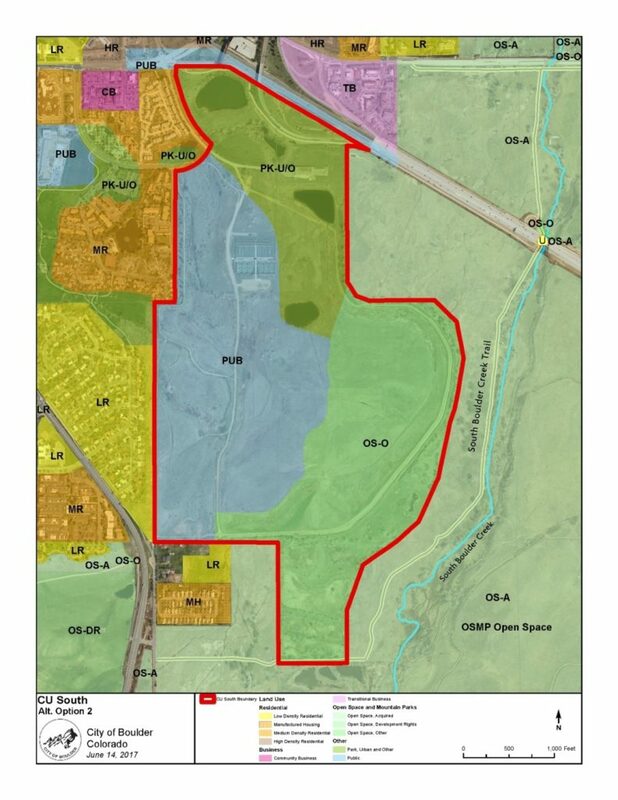 Parcels of land totaling 20 acres (6655 and 6500 Twin Lakes Road, and 0 Kalua Road) were the subject of two land use designation change requests under consideration as part of the 2015 Boulder Valley Comprehensive Plan (BVCP) Major Update process. The BVCP Land Use Designation Map defines the type of development, and the range of development intensity that can occur throughout the Boulder Valley. The parcels are located in Area II of the BVCP planning area, meaning that the BVCP identifies the parcels as eligible for annexation and development. This is part of the BVCP’s vision for creating an efficient development pattern that places housing close to existing infrastructure and helps to avoid sprawl. At its Oct. 19, 2016 meeting, the Boulder County Planning Commission decided to reconsider its decision from Sept. 2016 to approve a land use designation change for parcels on Twin Lakes Road in Gunbarrel (6655 and 6500 Twin Lakes Road, and 0 Kalua Road). The reconsideration hearing took place on Jan. 18, 2017, as part of Planning Commission’s regular monthly meeting. The Planning Commission accepted both written and oral testimony on new information. Planning Commission took action and did not approve any changes to Land Use Map designations for the Twin Lakes Road requests (Requests #35 and #36). The requests are no longer being considered as part of the Boulder Valley Comprehensive Plan Update (Docket BVCP-15-0001). The Boulder County Planning Commission officially closed the hearing and comment period for the Twin Lakes Road requests at the conclusion of the Jan. 18, 2017 Planning Commission hearing. Comments received on this topic after the close of the January 18, 2017 hearing will not be added to the public record for this docket. Planning Commission reconsidered its Sept. 21, 2016 decision to change the land use designation on Feb. 15, 2017. Planning Commission voted to deny staff’s recommendation regarding land use map changes for 6655 Twin Lakes Road, 6500 Twin Lakes Road, and 0 Kalua road. Planning Commission meeting agenda and minutes from February 15, 2017. The BVCP update has four main phases, each with community dialogue and engagement. The plan update is currently in Phase 4. Phase 1 — Foundations/Community Engagement Plan (complete). The foundations (technical) work that was completed in the first phase has been used extensively in community outreach and is available on the project webpage. Phase 2 — Issues Identification (complete). Phase 2 focused on collaboration with the community to refine and solidify priority issues to be addressed in the update through 2016. This phase included the survey, a series of check-ins with boards and commissions, and six local listening sessions in the community. Phase 3 — Plan Analysis and Updated Policies and Maps (underway). As with the first two phases, Phase 3 will entail multiple opportunities for community engagement. The planning team will develop choices and analysis, do the “housekeeping” updates, and write policy refinements and additions to better align the plan with other master plans and adopted city and county policies. Additionally, during this phase, the planning team will advance the 3D modeling and visualization tools to help convey options, scenarios, and tradeoffs and do further research and analysis to support a community conversation. Gaps in metrics to measure plan outcomes will be identified, and the full set of measurements further refined. Finally, the Land Use Plan and Area maps will be updated, reflecting input and analysis from the public request process as well as the scenario analysis. Phase 4 — Draft Plan and IGA (Spring 2017 – Summer 2017). Phase 4 will synthesize all the previous phase deliverables into a draft plan for consideration/adoption, again with opportunities for public review and engagement. Additionally, the “Comprehensive Development Plan Intergovernmental Agreement” (IGA) between the city and county (valid through Dec. 31, 2017) will need to be updated. Boulder’s City Council and Planning Board and Boulder County’s Board of County Commissioners and Planning Commission are responsible for changes to the comprehensive plan. Together, they are the four bodies in the four body review process. For details about the review process, please consult the City of Boulder FAQ Regarding the Change Request Process. Requests that affect only the City of Boulder, such as changes to land use designations of properties within Boulder’s city limits (known as Area I), must be approved by the Boulder City Council and Planning Board. Policy changes that affect both the city and county must be approved by all four bodies. So are requests to change the land use designations of properties that are in unincorporated Boulder County, which is known as Area II and Area III. During the initial screening process, any one of the four bodies could decide that a change request did not merit further study.